Student Pages » The lab activities in this module were adapted by Erin Bardar of TERC for the EarthLabs project. The Workshop Leader Resources were developed by Nick Haddad of TERC, Project Director of the EarthLabs project. These activities are based on the Exploring the Connections activities in the Earth as a System chapter of the GLOBE Teachers Guide. Why teach about Earth system science? Beginning to perceive Earth as a system can begin with something as simple as when we ﬁrst feel warmth from sunshine or get wet standing in the rain. However, truly understanding Earth as a systemEarth System Sciencerequires a quantitative exploration of the connections among all parts of the system: air, water, land, and life. Earth system science is a key to climate literacy. Understanding climate change requires understanding that Earth is a holistic system of dynamic, interacting components. Furthermore, understanding how the Earth system works is essential for making informed decisions about how to manage, protect, and sustain our planet and its natural resources. Why use this set of lessons? The lessons presented in this unit on Earth Systems expose students to some of the most current scientific research, data, and visualizations in a way that allows them to understand their world as an interconnected living system. 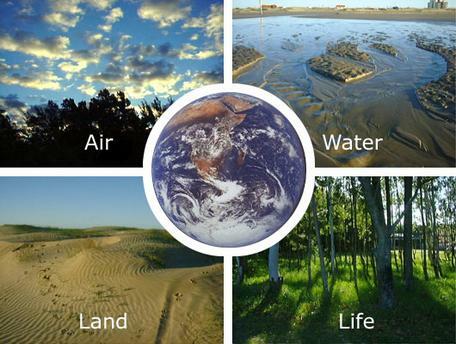 These activities will help students look at the Earth in a new wayas a living system. Students will learn to identify the parts of the Earth system and the processes that connect them. They start by looking for interconnections among components of the Earth system at the local level, using a study site close to their school. Once they have started to develop some familiarity with these local interconnections, they identify interconnections among components at the regional and then at the global scale. What is Earth System Science? How can we describe Earth as a system? How are energy and matter exchanged among the four main components of the Earth system (atmosphere, biosphere, hydrosphere, pedosphere)? How does the Earth system change over time? How is life affected by changes in the Earth system? 1. Identify a natural area, referred to in the curriculum as a study site, that students can visit to observe elements from all or most of the Earth system spheres, elements such as soil, vegetation, living organisms (even if just birds and insects) and possibly a stream, pond, or other body of water. A natural area is ideal, but a study site in a local park or even in a quiet corner on the school property will work. Inspect the study site for possible hazards. Are there plants, insects, landforms, or debris that are potentially harmful? No specific size is required for the study site. The interactions between elements of the Earth system occur at a wide range of geographic and time scales. However, the area should accommodate a visit by the class and have a rich set of interactions for students to discover (see below for more information). The curriculum unit calls for students to visit the study site just once, during the first Lab. At that time they will take photographs that they can refer to later in the unit. While it can be beneficial for students to revisit the study site, it's not essential to the curriculum. 2. Read the Lab Overviews section, which identifies all of the materials you'll need to gather and provides a quick scope and sequence of the unit. The resources below will assist you in planning and implementing a one-day workshop which will introduce the Earth System Science module to other teachers. Most of the resources can be edited by you so that you can make revisions to the suggested workshop plan. Workshop Outline (Microsoft Word 2007 (.docx) 162kB May28 13) This document provides an overall plan for preparing for and implementing the suggested workshop, and indicates where each of the additional resources listed below might be used in the course of the workshop.You may find it helpful to download and review this document first, before downloading the specific workshop resources.